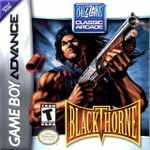 "Blackthorne (Blackhawk in some European countries) is a computer and video game, a cinematic platformer, that was developed by Blizzard Entertainment. Blackthorne is set on the planet Tuul, which has existed for hundreds of years without human knowledge. All of this time, Tuul's people have been ruled over by a single shaman who "was blessed with all knowledge". Years before the game begins, Thoros, the latest ruler, finds it near impossible to choose between his two sons as the next ruler. Believing it will solve the dilemma, he leads them to the deserts and kills himself. His body becomes two stones, light and dark, and he gives one to each boy to rule their own kingdoms respectively. The people of the lightstone form the kingdom of Androth, and the people of the Darkstone form Ka'dra'suul. But while Androth respects their stone, Ka'dra'suul reject theirs, and are eventually transformed into monsters by it. In this time, a ka'dra named Sarlac seizes power. He forms an army and leads them against Androth. Knowing of his people's doom, the ruler of Androth, King Vlaros, with the aid of the Androth magician Galadril, sends his son Kyle to Earth to save his life. Vlaros also gives Kyle the lightstone for safe keeping. He wishes that Kyle can one day return and use it to save their people. 20 years later, Kyle has become a renowned military captain and mercenary. After breaking out of prison facing court martial, Kyle begins having strange dreams, and eventually is reconfronted by Galadril. He is told that it is time to return to Tuul and save his people. The game begins here with Kyle setting out to kill Sarlac and reclaim his throne. Blackthorne was released for the SNES and MS-DOS in 1994, and with enhanced graphics and a higher color palette for the Sega 32X in 1995 and for Mac OS in 1996. The version for the Game Boy Advance was released in 2003. During the game, Kyle uses a Pump Action Shotgun as his primary weapon. As the game progresses, Androthi allies will help him upgrade the weapon, increasing its speed and power. As well as this, Kyle also finds many other useful items." Source: Wikipedia, "Blackthorne," available under the CC-BY-SA License.